In the past (WAAAAAAY in the past), I was sort of averse to spoilers. I liked being surprised by the new cards and I wanted to experience a set in a face to face kind of way. Things change (I’m still not using a freaking playmat! 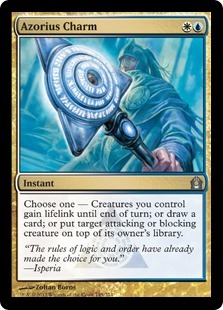 ), though, and I really dig the way the MTG community uses the weeks before a set’s release to generate interest, speculate and brew on SH*T THAT’S NOT EVEN REAL YET! It’s genius, really. So, I’ll back it up. 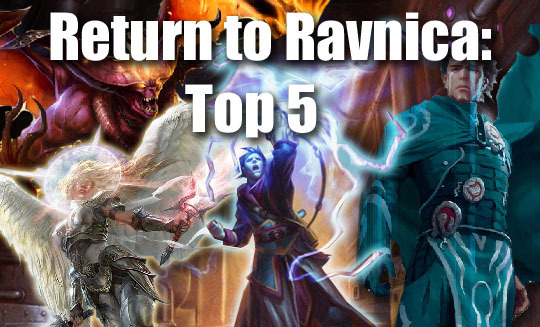 I’d like to talk about my favorite 5 cards from the Return to Ravnica and their various applications. 5 for Contructed and 5 for Limited. Right, I know what you’re thinking. JOHNNY! Calm down I’m not brewing with this yet, I’m simply saying this: someone will break this. It might not be until the next set or maybe the set after, but it’ll get some play. 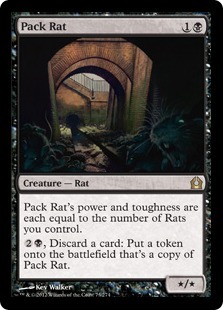 You’ll groan like you do now when you loose to infect, it’ll be second tier likely, but man! 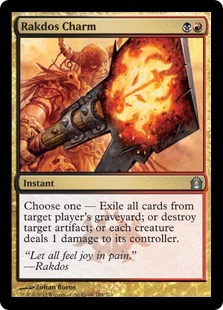 when this card gets cast you’ll be sorry. It’s a real good thing Overload won’t work with this. I expect this to be a set-up for Grixis tap-out or a one of in a Delver variant (which will need a mid and late game strategy with a lack of free spells). I don’t know, I think it’ll be important eventually. Mark my words! (shakes cane in the air). Can you say late game Combos? 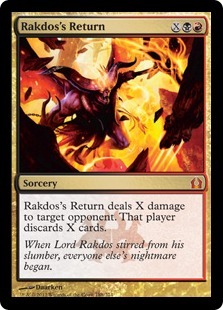 C-rift End of Turn… Rakdos Return during my main phase… RESPONSES?! Mike Flores said it first, but I’ll repeat. 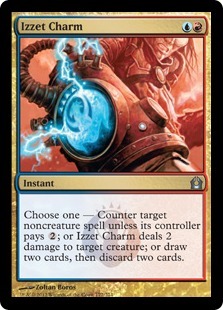 DON’T C- Rift a Snapcaster with open counter mana and a Dissipate or Syncopate or other counters without PATE in them, … (You will be laughed at). 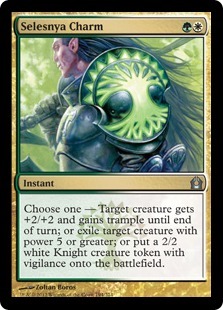 But like C-Rift (yea I’m gonna keep calling it C-Rift), it deals with Planeswalkers. It’s a mid-game phase 2 kinda card and it doesn’t affect the board, so stop crying and build around it, you baby. 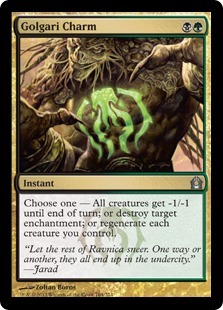 Did you read the part about when your opponent inevitably deals with this creature (ala Ultimate Price) the things you chose go to hands, AND NOT BACK INTO PLAY? SHEEEIT! wait you can target things in Graveyards? And ANGELS? Just sayin’ bro. 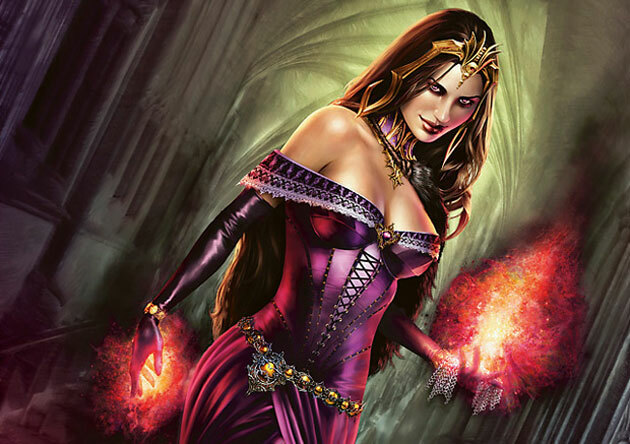 She’s even easy on the eyes without making me feel all pervy (I’m looking at you Liliana of the Veil). 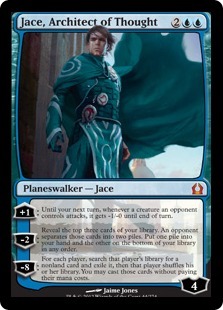 The Magic: The Gathering version of Batman, Jace is in full Dark Knight Returns mode here (He’s not the Planeswalker this city wants, but he’ll be the Planeswalker this city needs). Plus, look at that sweet cape flair. I bet he conjured a large fan to blow that breeze. He’s got a defense, and a sweet a$% -2 ability. You’ll be card advantaging the willies out of you opponent. I’m not really thinking the Ultimate will see much action (You’ll be too busy drawing to want to build him up) but if that goes off I bet you’ll figure out a way to make it good. It’s an Uncommon so i bet you can find this guy in the draft. NO! I don’t know what # pick. But he’s good. 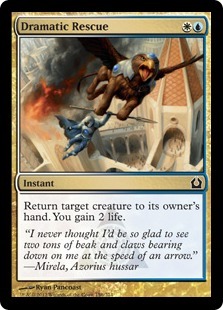 I remember night unto a day when (gset up from rocking chair) 3/1 blue fliers for 3 mana couldn’t block non-fliers. AND WE LIKED THEM JUST FINE! This guy can block if you need him to. And he’s a Twiddle (for all intended purposes) at his least effective. You won’t always wanna throw him down the second you draw him. Duh! Options are good – taste the rainbow. 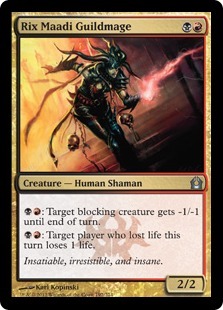 I think Izzet is the best in Limited then Selesnya, Azorius and then Gogari and Rakdos are tied. Mid and late-game mana sinks, expect to lose if your opponent gets to produce 3/3 centaurs each turn while you draw another land. The John Wayne Gacy of the set, in that he’s goofy looking but deadly. Pogo the Clown here draws two cards then he kills things. Untapping with this guy twice should win you games. With 3 toughness though, he’s a lightning rod. Mostly he’ll trade 1 for 1. When he gets going, look out! 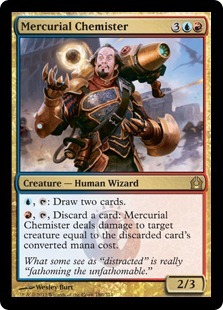 I’m playing Izzet at the prerelease based on Hypersonic Dragon and maybe maybe opening up this guy. 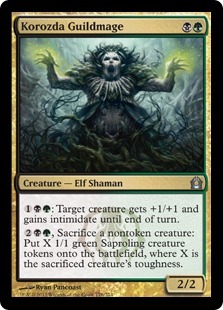 After playing some online sealed with a friend, we both immediately notice the raw power of this card in limited. What’s that you say? Never draw a land and wish it was something else. 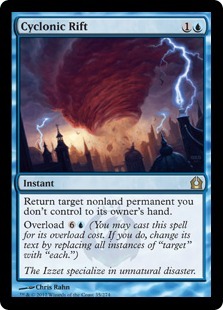 If you play this card on curve its good. 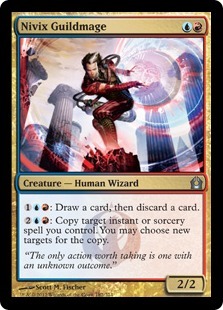 But even though I believe this set is removal poor I’d suggest waiting until you can copy him. 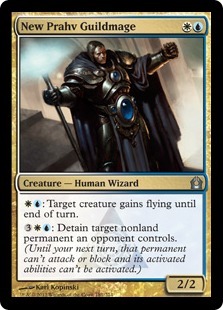 Once copied nothing short of two removal spells or a detention sphere can stop you. If you play this turn 5 and copy it. On turn six with a land drop you have 2 2/2’s. Not bad but nothing to write home about. You attack and create (with the land you dropped) two 4/4’s with two 4/4’s blocking from there it just gets insane. 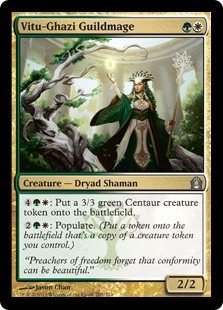 I’d switch to splash black in the third pack for this card. It won the board each time I untapped with it. 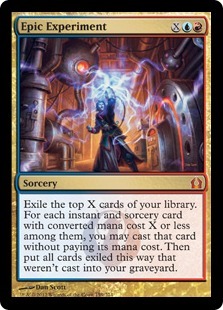 It’s my favorite card in limited and it’s power might just be good enough for constructed. So that’s my take on the RTR scene. 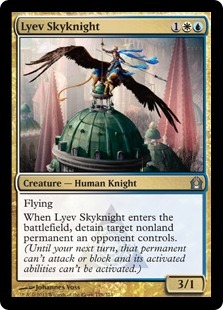 What’s your favorite card for Limited/Constructed? Disagree with me? You’re probably not correct but I’ll read your rants in the comment section. 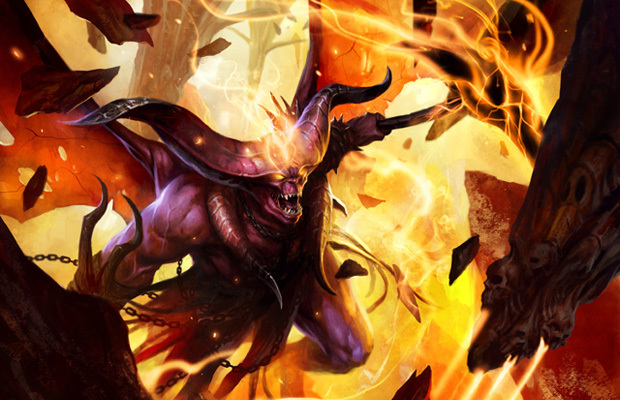 This entry was posted in Magic: the Gathering Articles and tagged jace, mtg, return to ravnica, top cards. Bookmark the permalink.